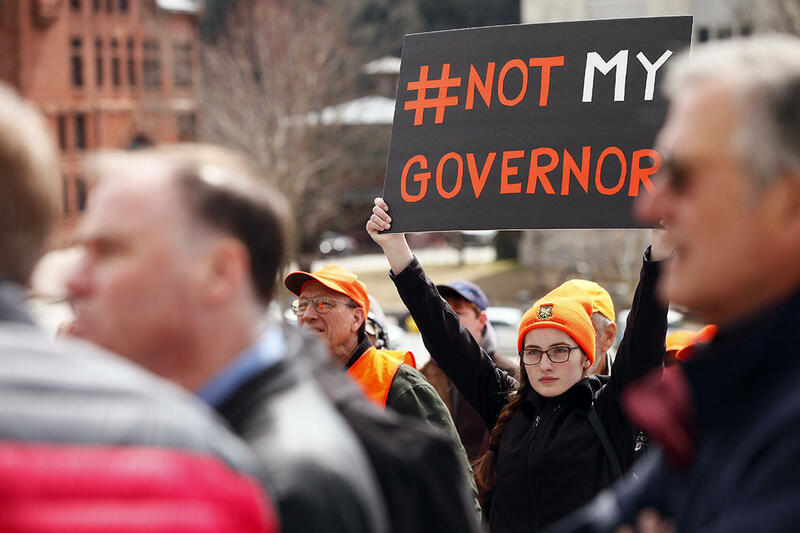 A bill-signing ceremony on the steps of the Vermont Statehouse turned into a loud and surreal spectacle Wednesday afternoon when opponents of the historic gun legislation tried to shout down Gov. Phil Scott. Elected officials in Vermont have historically paid a steep price for supporting gun control measures, but the politics of guns in a post-Parkland era may be shifting. The scene that played out on the Statehouse steps Wednesday afternoon demonstrated the intensity of the opposition to gun control in Vermont. As Gov. 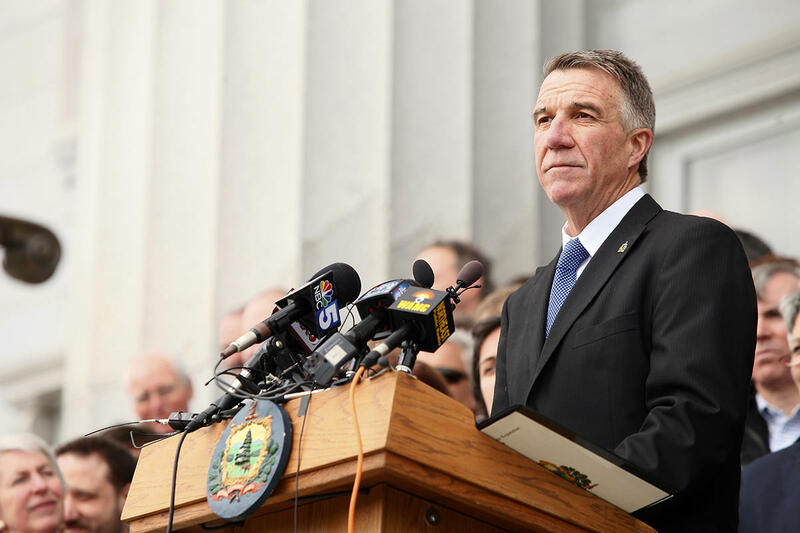 Phil Scott emerged from the Statehouse to begin a bill-signing ceremony for historic gun legislation, about 100 gun-rights activists erupted in chants of, "Traitor! Traitor!" Bob Atkinson in front of the Statehouse Wednesday before the governor's remarks. Rutland County resident Bob Atkinson was among the orange-vested protesters on hand to register his disgust. He brought a homemade sign to the event that said, "You ignored emails. You ignored calls. You will not ignore us in November. "I voted for Phil Scott, Atkinson said. "I feel he really let us down." Atkinson says he wants to see Scott, and the Vermont lawmakers who sent the legislation to his desk, pay a political price for their breach. Chet Greenwood, the chairman of the Orleans County Republican Party, says Atkinson is definitely not alone. "Yeah, he's going to lose a lot of the gun rights people," Greenwood said. Greenwood too opposes the legislation signed by Scott Wednesday, called S.55, which includes universal background checks, a ban on high-capacity magazines, and raises the legal age to purchase a gun to 21. But Greenwood says he's not so sure Scott will experience the backlash that voters like Atkinson are hoping for. "And he's going to be picking up some independents and moderates," Greenwood said. Vermont politicians, including Scott's Democratic predecessor, Peter Shumlin, have for the most part steered well clear of gun issues. And for good reason: Elected officials who support the gun control measures frequently suffer the consequences at the ballot box. That's despite the fact that polls show overwhelming support for modest gun measures, like universal background checks. Jennifer Tedesco, among the crowd gathered to watch the governor sign the bills in front of the Statehouse. "Anytime you get public opinion that's overwhelmingly in favor of something, policy moves in that direction. Except with guns, it doesn't," said Ed Burmila, an associate professor of political science at Bradley University, in Illinois. "So that gun control paradox is something that's very interesting to a lot of political scientists." Burmila says there's a good explanation for that paradox. "The key to it is that people who are opposed to gun control are a lot more committed to the issue than people who are in favor of it," Burmila said. Some political minds in Vermont say that, after the shooting deaths of 17 people in Parkland, Florida, earlier this year, and an alleged near-miss at Fair Haven Union High School, that enthusiasm gap may be shrinking. "I think it has the potential to be a watershed moment, said Burt Johnson, a professor of political science at Middlebury College. "But I think it's a little too early to tell." Rich Clark, a professor of political science at Castleton University, also says it's unclear at this point whether Parkland, or Fair Haven, will have a lasting impact on gun politics in Vermont. "I wish we had some polling since Parkland," Clark said. But Clark says the 2018 election cycle could help gauge the power of the new wave of gun activism. "If the mobilization that came from that sticks, there may not be any blowback [for supporting gun legislation]," Clark said. "Now the question is, would there be blowback from not acting?" Scott already faces one challenger in the Republican primary. His opponent, Keith Stern, has used Scott's support for S.55 as his primary line of attack. But Stern has run for higher office several times before,twice for the U.S. House, and once for U.S. Senate. He's never won more than 1.1 percent of the vote in a general election. Johnson says he thinks Scott's on safe ground, despite his support for gun legislation. "To the extent that that will threaten him in his primary, I tend to doubt that," Johnson said. "I think he's in a fairly strong position. Sen. John Rodgers, who says he's been contacted by conservatives asking him to consider challenging Scott. A sign, Rodgers says, some of Scott's base has left him. And once he's safely into the general election, Johnson says he thinks Scott's popularity will carry the day. A poll conducted earlier this year found that Scott has among the highest approval ratings of any governor in the country. "He's a very popular incumbent. He won with a solid majority. People like him," Johnson said. 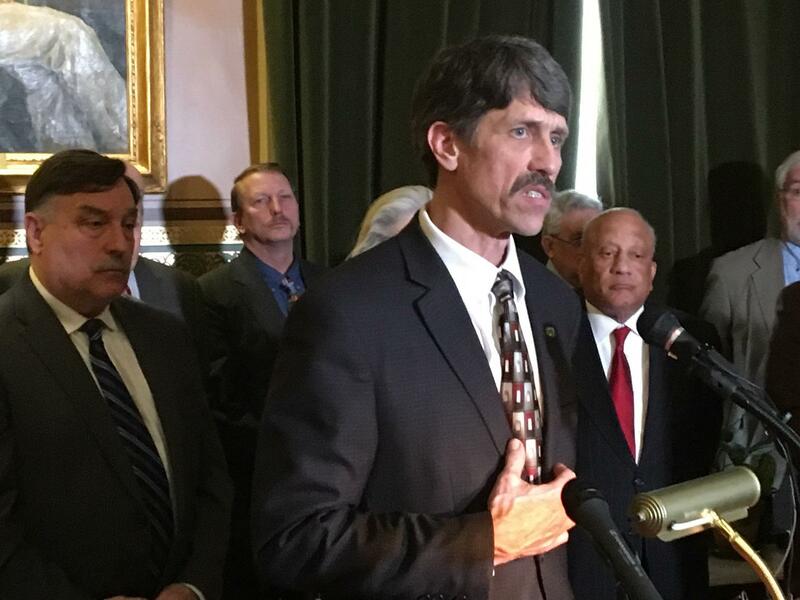 Sen. John Rodgers, who represents Essex and Orleans counties in the Vermont Senate, and has been one of the more vocal opponents of S.55 in the Legislature, says Scott is more vulnerable. "When I have a conservative Republican from Barre who has donated ... $2,000 to Phil's governor run call me on the weekend and ask me to run for governor, I think some of his base has left him," Rodgers said. Rodgers, a Democrat, says several people have asked him to run against Scott in 2018; he says he's considering it. And Rodgers says Scott is mistaken if he thinks new support from Democrats who support the gun bills will offset the erosion of his conservative base. "I find it hard to believe that Democrats and Independents who may support him on this one issue when he has not supported any of their other issues are going to make that cross. I find that very hard to believe," Rodgers said. What's next for gun control? While Scott may have signed gun legislation on Wednesday, he's made it very clear that he will not support an assault rifle ban, which many gun control advocates say they'll push for next year. And for gun rights purists that want to see Phil Scott pay for his sins, Chet Greenwood says he'll have some advice. "Careful what you wish for, because the next one that comes in here, if he's not on your side, they're going to start taking guns away from you. Because if they had their druthers, that's what they would have done on this one," Greenwood said. Gov. Phil Scott during his remarks before the bill signing Wednesday in front of the Statehouse. Both sides of the gun debate have their own political action committees. Clai Lasher-Sommers, director of Gun Sense Vermont, says her organizations elections arm, called Gun Sense VT Victory Fund, will be active in 2018. "Because you don't ask someone to work and vote on legislation that is really difficult without ... working with everybody in their area to get out the vote to help them in whatever way we can," Lasher-Sommers said. Lasher-Sommers says Gun Sense hasn't determined yet what form that support will take. "So we don't have a campaign plan yet. We just know that very soon we'll have one, and it will be to help the people keep their seats that voted for gun safety bills," Lasher-Sommers said. The National Rifle Association did not respond to an interview request this week. But it too has a political action committee, called the NRA Political Victory Fund, registered in Vermont. As The Hermitage resort in Wilmington struggles to emerge from its financial difficulties, others in the Deerfield Valley are worried about the ongoing effect of the resort’s closure. What's Next For The House's Gun Control Bill? On Friday evening, after 10 full hours of debate, House lawmakers voted 85-59 to approve sweeping changes to Vermont’s gun laws. But the bill, called S.55, still has some hurdles to clear in Montpelier. Here’s what’s next for S.55.